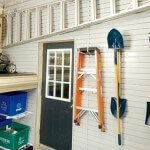 The thought of organizing the garage can be daunting. Unlike the kitchen, where there are obvious areas for storing specific items (drawers for cutlery, cupboards for dinnerware) the garage is just a big undefined space. Before we start designing storage solutions, organize your belongings into useful groups. Where you place groups of things depends on how often you use them and how accessible they need to be. Here are typical ways to organize your belongings into groups. You’ll likely need an easily accessible section of the garage to store cleansers, wax, and windshield wiper fluid, cloths and brushes. These things can all be neatly organized with a combination of shelves, baskets and hooks. 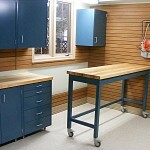 If you’re a car enthusiast, you may want space for a workbench or cabinets. It’s important to store bikes safely to avoid damage to the family cars. 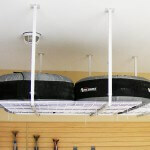 The most efficient winter storage is on the wall or suspended from the ceiling. For easy access during the warmer months, a floor bike rack is an option. Sharp garden tools and poisonous chemicals need to be stored safely away from children and pets. Long-handled tools such as rakes and hoes can be hung from hooks on the wall and smaller hand tools such as trowels and shears can be stored in baskets on the wall. Electrical tools can be hung from hooks with a separate hook to safely store power cords. Fertilizers, plant food and other chemicals can be safely stored in cabinets, with or without a lock. 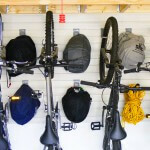 Your garage can be a great place to store extra household items. And it’s a lot easier to access a garage than carrying bulky items downstairs to the basement. 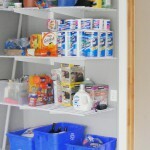 A combination of shelves and cabinets can keep items organized and easy to find. The goal of organizing the garage is to get everything off the floor, and this includes recycling and compost bins. 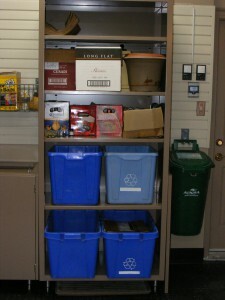 Shelving and wall hooks can accommodate most bins. Garbage cans can be stored neatly, away from any critters, near the entrance into the house or mudroom. 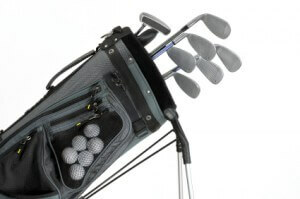 Storing sports equipment efficiently can be a challenge. You need a way to store it so both adults and children will be able to find the item they need and then put it away neatly. The equipment can be organized by sport, with a combination of hooks and baskets to store everything from hockey sticks and gloves to baseball bats and balls. It’s also handy to be able to rotate winter and summer equipment to be easily accessible in the right seasons. Tires are best stored off the ground to save precious floor space and to avoid pressure on the rubber. They can either be stored on wall racks or in overhead storage. Garages do a lot more than just shelter cars. In addition to providing storage, they are an ideal spot for tasks like gardening, bike repair and woodworking, because you’re protected from the elements and the space is easier to clean. Once you’ve grouped your belongings, you’ll need to find the right hooks, baskets, shelves and cabinets to maximize your space. With some ingenuity and creativity, even the smallest garage can store your possessions, along with workspace and a place to park your car. Have a look at this transformation to see how it can be done with Nuvo Garage’s custom-fit storage solutions.